Bajaj launched Avenger cruiser style bike. 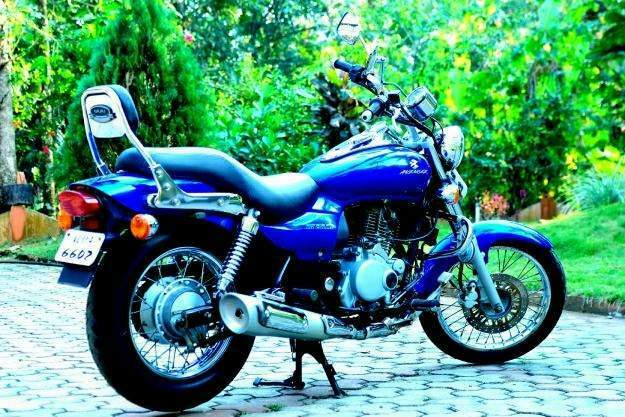 It basically draws style from bajaj Eliminator which had an air-cooled, single cylinder Kawasaki engine. Bajaj engineers changed the Kawasaki single engine with more successful, 178.6 cc DTS-i engine of the Bajaj Pulsar sport bike. Bajaj Avenger 200 DTS-i has a 198.8cc 4-stroke, oil cooled engine which produces max power of 17.51Ps/12.88Kw at 7000rpm with max torque 16.71Nm@6000rpm. 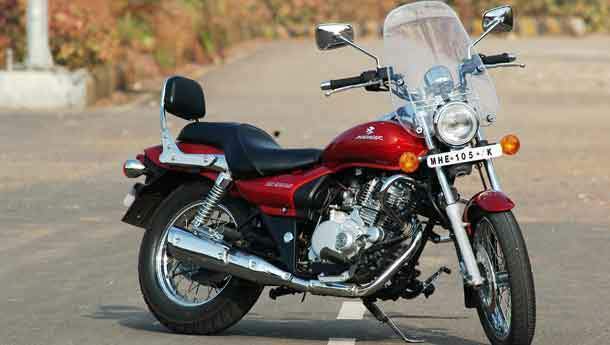 Bajaj Avenger is first cruiser style bike developed by an Indian company. Avenger was upgraded in 2007 with an new increased engine capacity to 200 cc. I uses oil-cooled engine which is modified version of Bajaj Pulsar 200.It has great detailing like low saddle height, broad saddle seat, forward foot riding posture and a special backrest for the pillion. Bajaj Avenger DTS-i is available in black and red colors. With the help of bright headlamp visibilty during night is great. Effective suspension set up ensures supreme comfort at highways and city roads.Oil cooler ensures optimum oil temperature even at high speed, thus there is no loss in performance. Bike engine remains smooth and you can crunch miles on miles in a relaxed and fuss free manner. Bajaj Avenger cruiser bike has fuel efficiency of 35 km/ltr in city. The fuel tank capability of the bike is 14 liters with a reserve capacity of 3.4 liters. The utmost speed that Bajaj Avenger can achieve is 115 km/hr with a power rating of 17.5 Ps at 8000 rpm and 16.78 Nm at 6000 rpm. The cruiser bike can track the race of 0-60 km/hr in just 5.9 seconds. The powerful new engine of Bajaj Avenger from the re-configured exhaust system flings radiance on the bike’s fresh vitality and passion. Bajaj Avenger’s dual cradle frame 220cc DTSi engine taken from Bajaj Pulsar also supports diverse engine arrangement to costume the bike’s cruiser temperament. The advantageous oil cooling that helps to sustain a stable oil temperature during stiff riding and high heat conditions is mated to a five speed gear transmission. The DTS-i engine belts out 17.51 Ps of peak power at 8,000 rpm and develops 16.78 Nm of maximum torque at 6,000 rpm. Bajaj Auto has further added one extra patented expertise to Bajaj Avenger that is “Exhaus-TEC” (torque expansion chamber). The technology ensures highest performance even at squat power-train and satisfying silencer sound. The minor rim assures improved acceleration which makes journey quite comfortable for long distances. 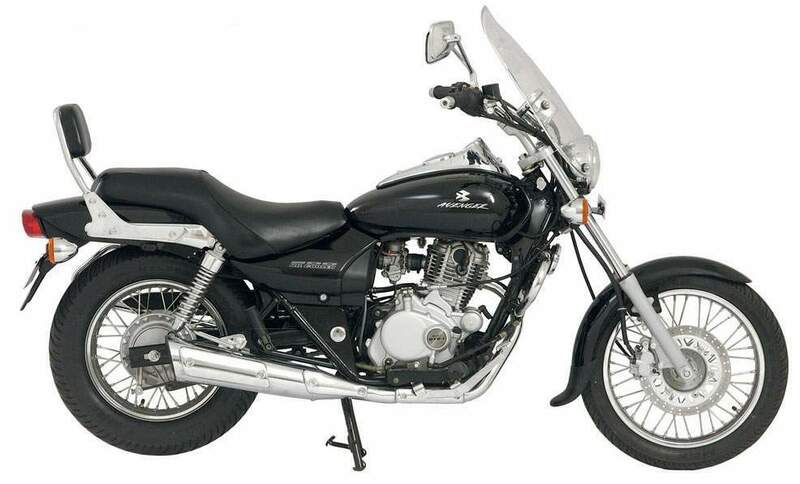 Bajaj Avenger has superb brakes which work in an enormous approach. Both the shock absorbers of the motorcycle bear to furnish enjoyable riding experience. Large windshield averts gusty winds which normally snags the rider. The cruiser is equipped with front disc brake of 260 mm which is hydraulically-operated disc brake and rear drum type brake which places it to the lead of the other cruisers. Bajaj Avenger is empowered by telescopic fork at front with 140 mm travel and the rear shocker is five way adjustable hydraulic type, triple rate spring with 90 mm travel. The rear shocker can be adjusted for five times which can be used on different terrains which makes it a versatile driving bike. Moreover, one can also do denser and flexible settings for a pillion rider as per the requirements. In both the settings, seating arrangement supports the shock absorber to have a comfy experience.